Wright’s Food Emporium is somewhere I have been champing at the bit to visit for ages. Every report I have heard has been along the lines of ” You have got to go, it is the business”. 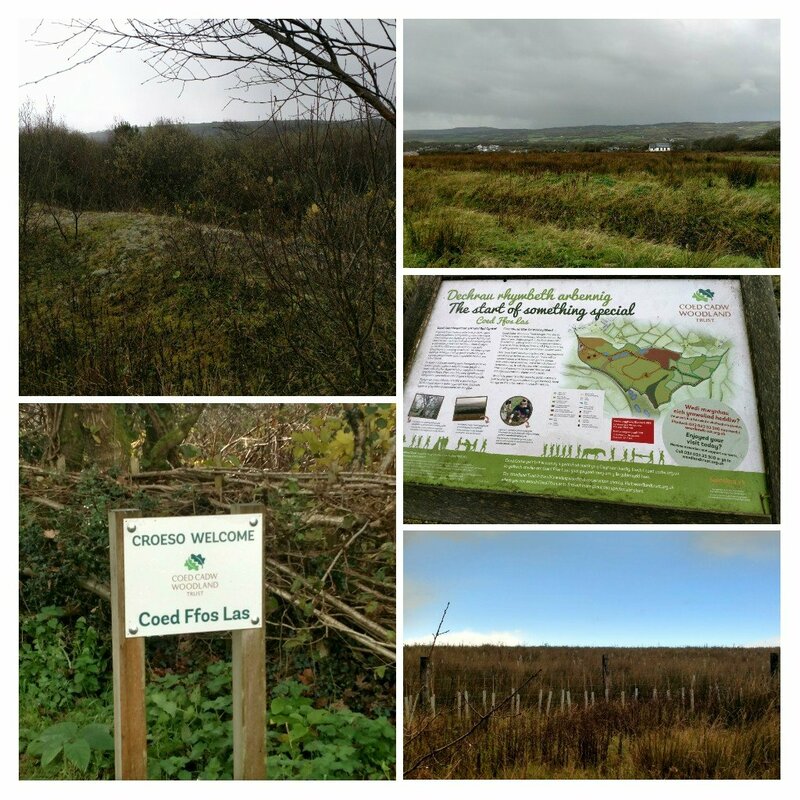 A trip to West Wales (not often I am out that way) on Memorial Sunday to have a look at the very beginnings of the Woodland Trust’s First World War Centenary Wood (a planned 90,000 tree wood of oak, alder, mountain ash, willow and hawthorn) at Ffos Las gave me a reason to venture out west. The wood is, hopefully, the start of something rather lovely – you can make a donation towards the cost of creating and maintaining a living, ongoing, memory to the fallen (which sadly included my Great Grandfather – one of the trees is for him), but wandering around it left us in need of sustenance. It was a tad polar up there and we got caught out in the open in a hailstorm. One of the dogs (the hard one) was as happy as a pig in …., the other one not happy at all. 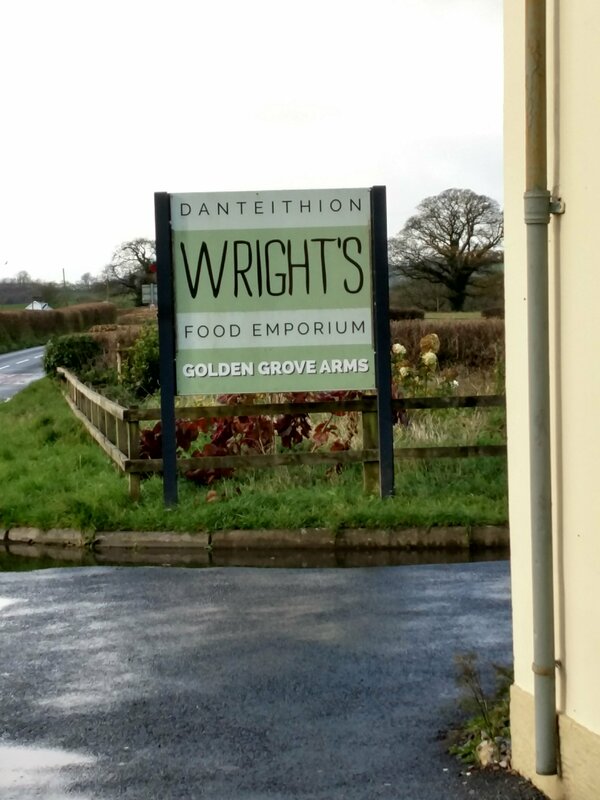 20 odd minutes drive away (also very close 7 mins drive – to the Wales National Botanical Gardens), in an old pub in the village of Llarnathney, is the rather charming looking Wright’s Food Emporium. Being so close we jumped at the chance to find out what all the fuss was about. Inside it is a rather higgledy piggledy set up with a deli at the front and rooms off in all directions. 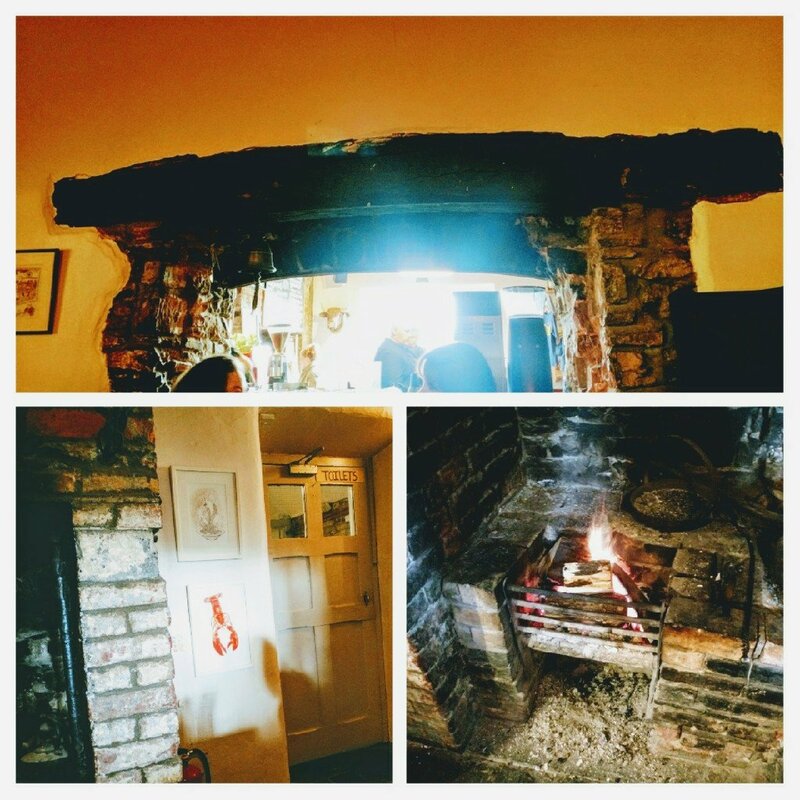 This included the back room with a roaring fire (most welcome as we had got drenched in the aforementioned hailstorm),which (joy of joy as we had our two mutts in tow) is dog friendly. 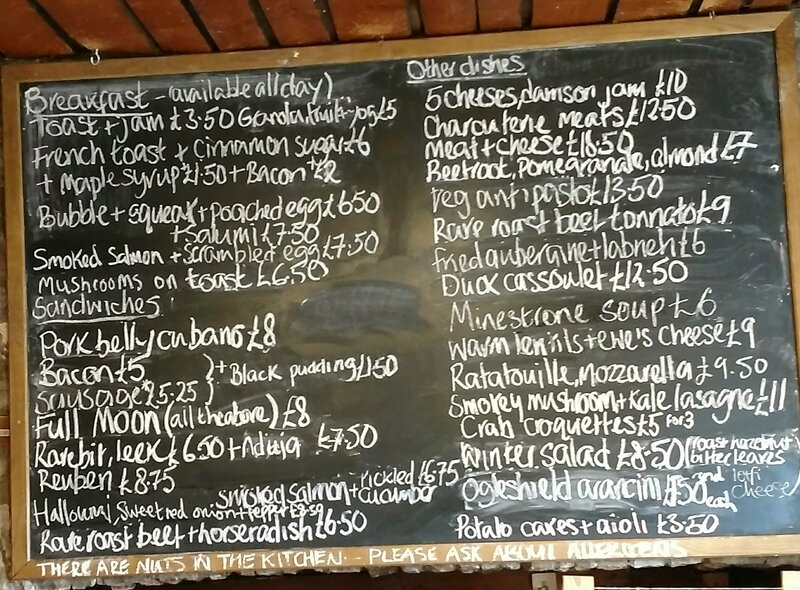 The menu is on a chalk board in the deli area and one look at it confirmed in my mind that we were on to a winner. Lots of really interesting stuff to cover all bases (breakfast, bunch, lunch, tea and cakes and supper, with something for carnivores and veggies alike). To my mind the food offering in the day is set up for people to share rather than ordering distinct dishes each (although there are some more substantial dishes such as cassoulet, as well as sarnies like cubanos and reubens, a lot of the menu items seem to be in the area size wise and price range of what the Spanish would regard as tapas, media raciones and raciones). In the evening it reverts to a more traditional starter and main course set up. 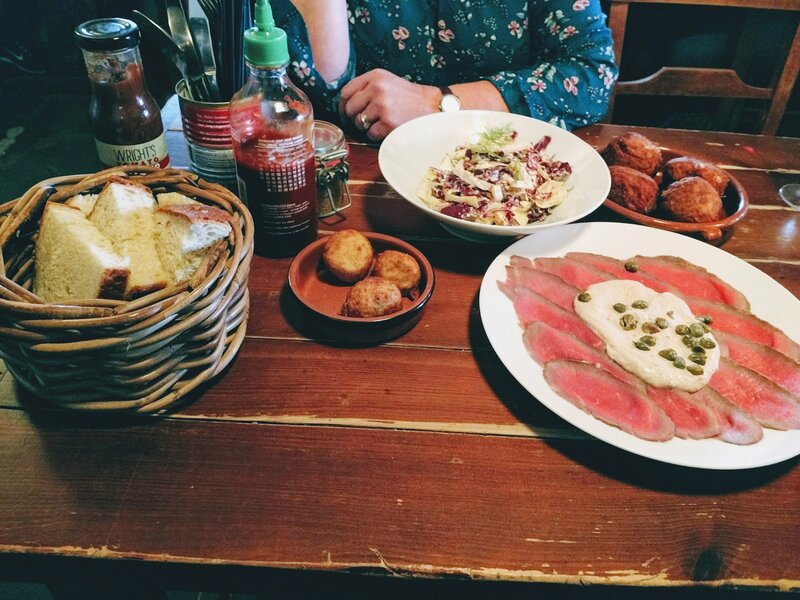 We ordered stuff we could share and boy was it a nice selection. 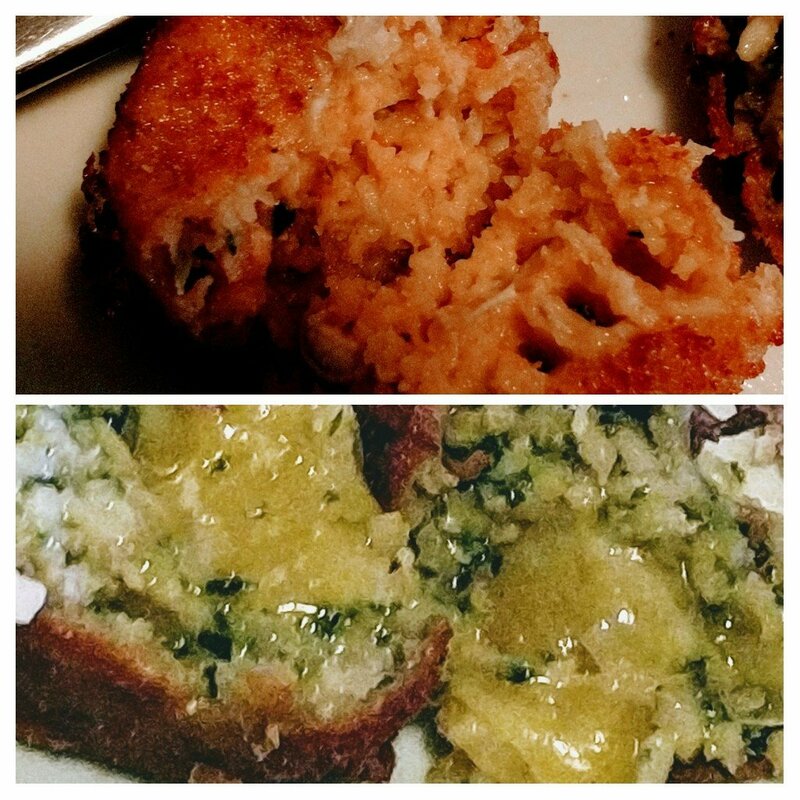 We followed these with more deep fried goodies in the form of 4 arancini (a bargain £1.50 each). These were big buggers with a beautifully crisp exterior and a silky rissoto (cooked bang on) interior hidding a generous blob of melted ogleshield cheese. 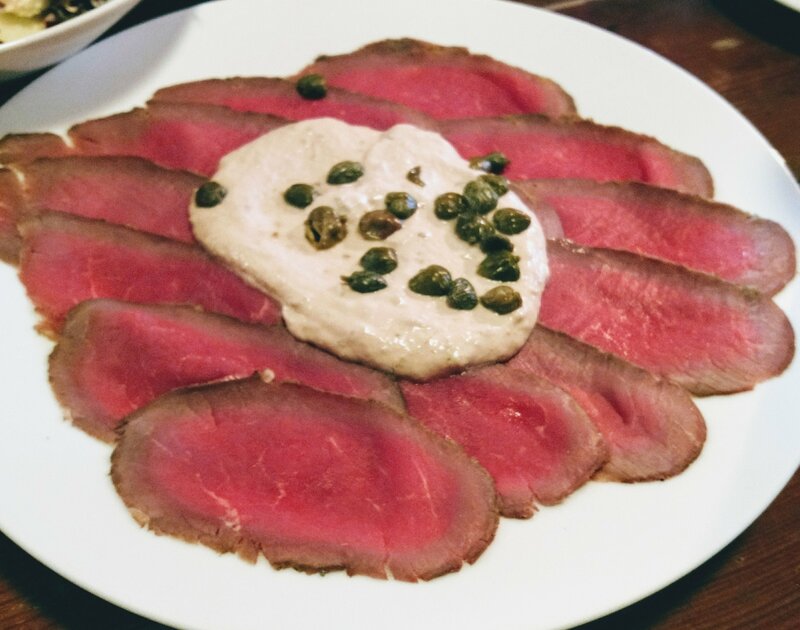 On the menu, one item that called out to me was the rare roast beef tonnato (£9). Usually made with veal this is a surf and turf dish, with the tonnato being a sauce comprising of mayonaise, olive oil, tuna, anchovies, mustard, lemon juice (quite alot) and capers. Your brain tells you no, no, no, but I can tell you your taste buds when it arrives will be yelling yes, yes, yes. 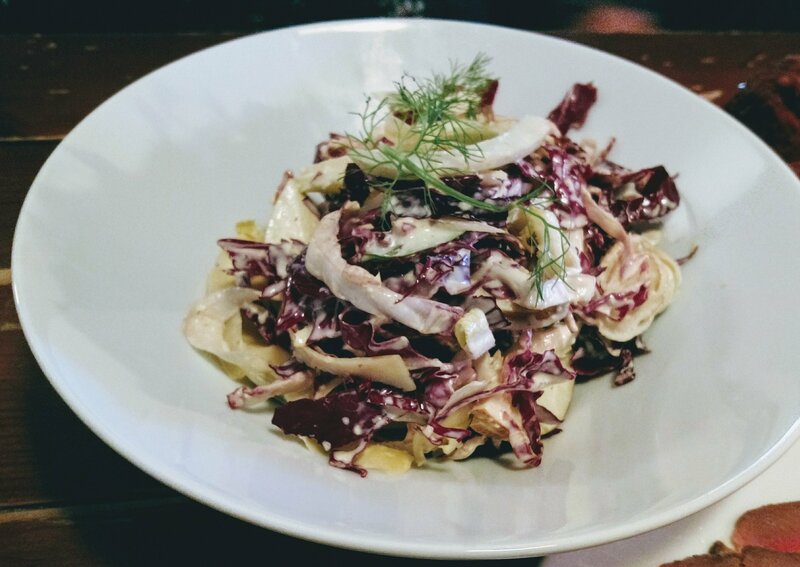 Feeling the need for some greenery, we opted for a winter salad (£8), here a rather sophisticated slaw, with bitter leaves, cabbage, sharp apple slices, a creamy mayo and, to finish it all off, some lovely candied hazelnuts. Top quality stuff and something that would make both avowed carnivore, like me, and dedicated veggies very happy. 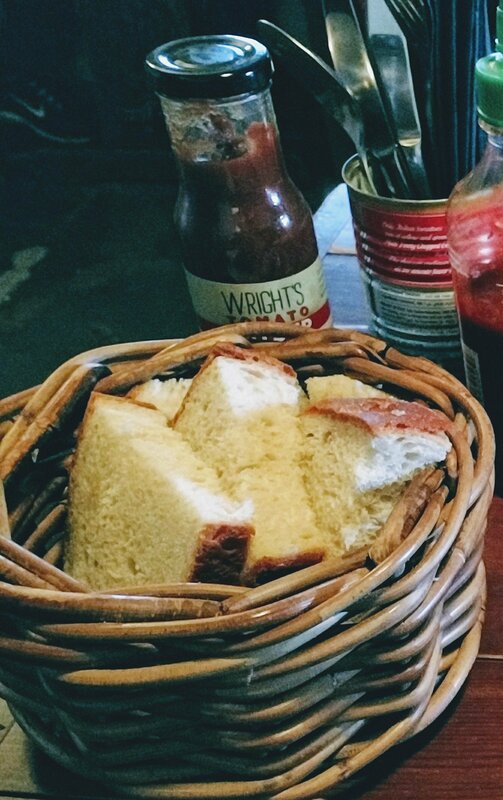 A special mention should go to the bread, brought free of charge to the table. Dear Lord it was good. A crisp, salty, crust gave way to a light as a feather interior. Some of the best bread I have tasted in many a year (I bought a loaf in the deli on leaving as I had to have some more). 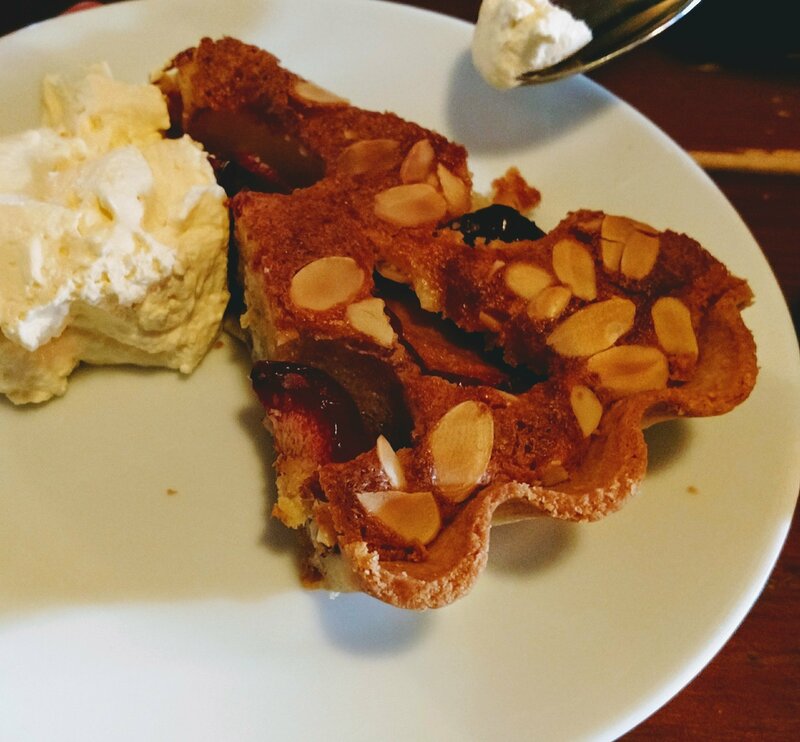 If I had had room I would have gone for the brownies (which I suspect would have been uber gooey), but Mrs. SF had her eye on a fine looking plum and almond tart (with a request from me for an extra spoon). A high class tart this, with some fabulous pastry. 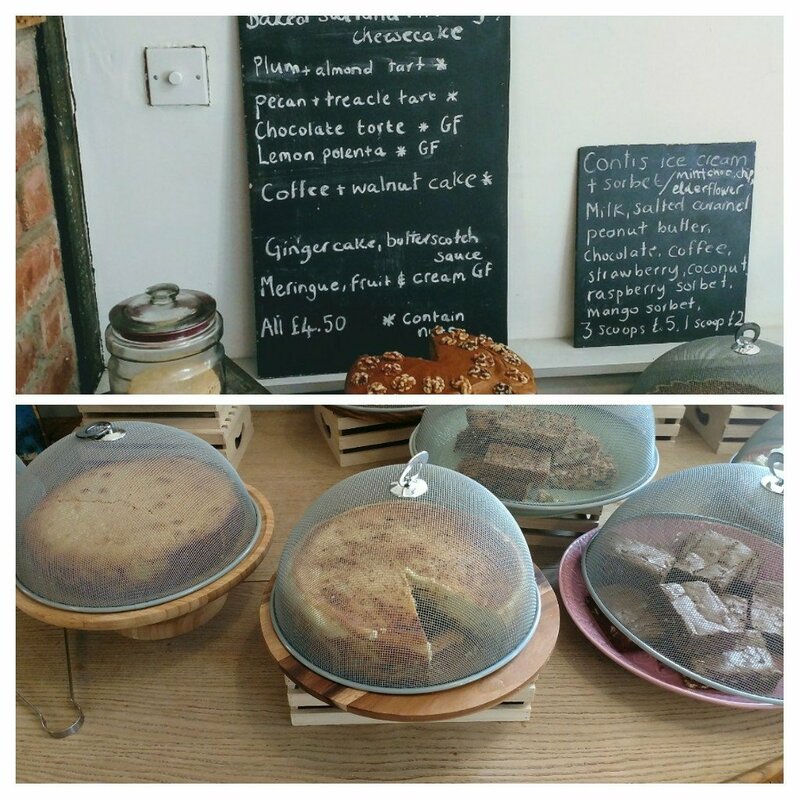 Someone in this place seriously knows how to bake (with this tart and the stunning bread being exhibits 1 and 2 in the case of the excellent baker m’lud). Not much of a hophead me, but even a beer ignoramus like me can recognise a quality offering. 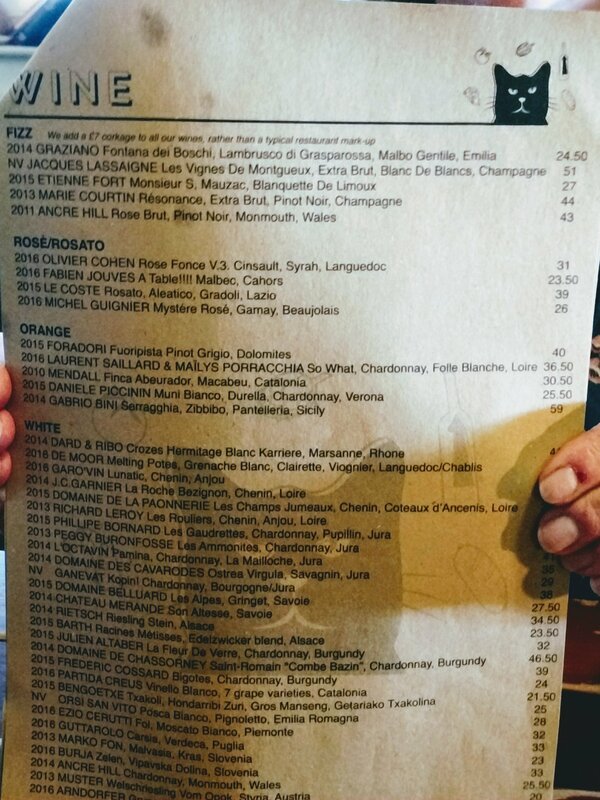 As for the wines they have a really eclectic list with loads of interest and a focus on “natural” wines. It covers regions and grapes that are off most people’s radar and as such is a list I would have loved to have got my teeth into. and a few Welsh wines making it on to the list. If I had not been driving, based on our rather diverse food choices, I would probably have gone Austrian and chosen either the Grüner Veltliner or Weischriesling on the list. Both good food wines which (especially the Grüner) go with pretty much anything not to heavy. Nicely priced at £20 for the Grüner (goes generally for around £13.50 retail) and £25.50 for the Weischriesling (not sure retail price – tricky stuff to get hold of in UK is Weischriesling, which is a different grape to riesling despite the name). 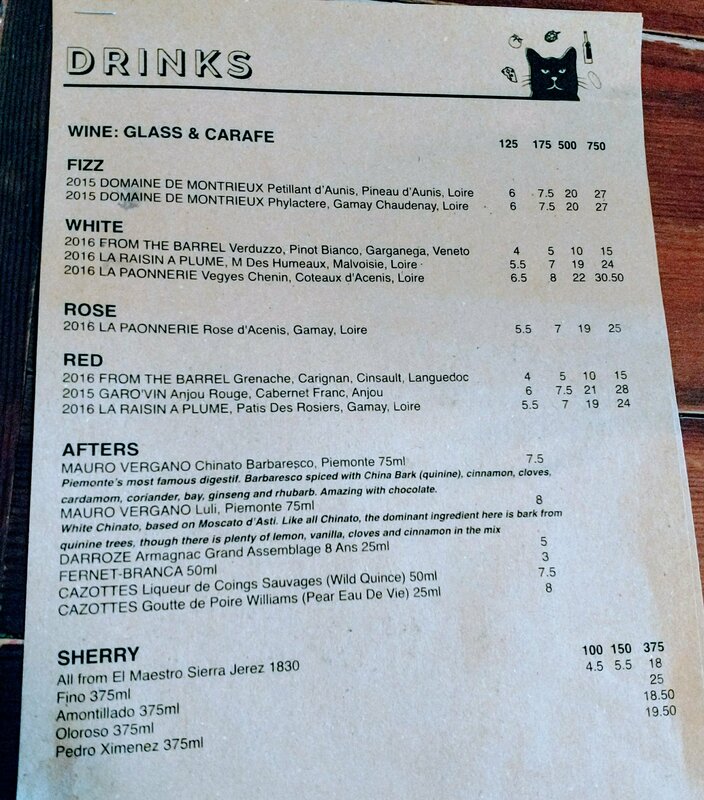 Mrs. SF is a rosé fan and her interest was piqued by the Loire gamay rosé on the list (£7 per 175 ml glass – it comes in a smaller glass and carafe formats, as well as by the bottle). Lovely drop (I had the tiniest of sips) with macerated red fruits on the nose and palate. 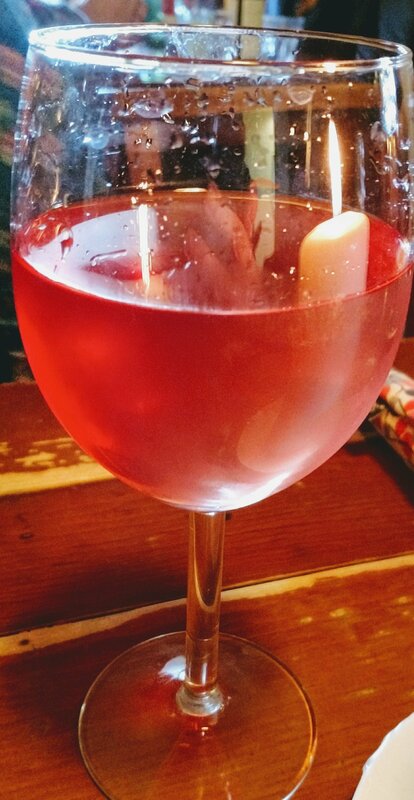 This wine was nice without food, but it really came into its own with the food. As I was driving I settled on a square root blackcurrant soda – a very superior soft drink which assuaged (a little) the fact that the booze was off limits. We both ended proceeding with coffees (rather good) in order to finish off the drying off of our clothes process by the fire before the drive home. Seriously impressed with this place. Great food with lots of interesting and above all tasty stuff. The booze offering is equally good and full of quality from top to bottom without the pricing operating at break the bank mark ups. Price wise for two of us the food and drink (sans a well deserved tip – service was excellent, with well trained staff who are very knowledgeable as to what is on offer) was about £43. Bearing in mind the quantity and quality of what we got, I though this was excellent value. A huge bonus for me is they have dog friendly eating areas, but for those not keen on mutts other areas are doggie free. So the answer to my usual question of “Would I go back?” is hell yes!!! One point to note is you cannot book (unless your party is 6 or more), except after 6pm on Fridays and Saturdays. It was busy (peak hours are between 12.30 and 14.30) during our visit (we arrive at 12.30), but there was a fairly quick turning of tables when we were there (we weren’t in anyway rushed out but a fair few people seemed to be in and out for a coffee and a sarnie) so you probably won’t have to wait too long. My advice is if you are within 50 miles of this place detour to it! The deli is also great. 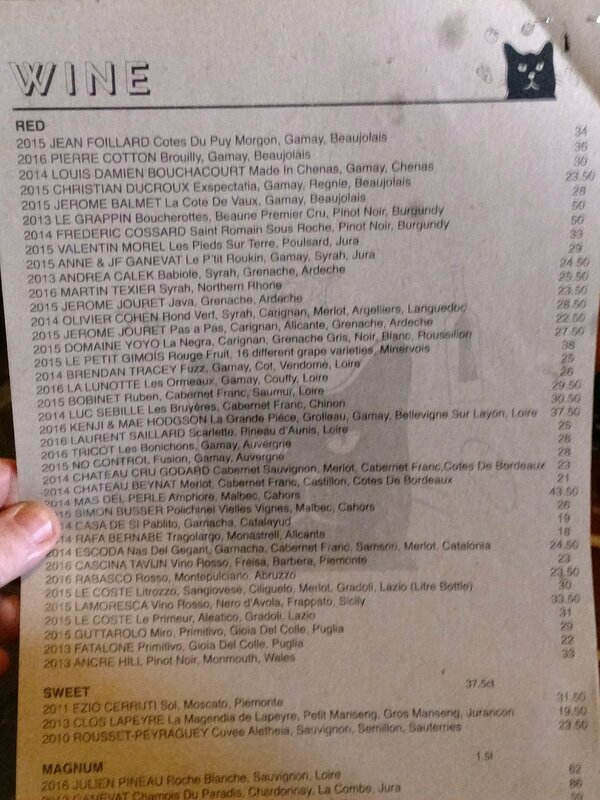 Lots of great wines to buy retail, amongst many other goodies. It is a bit of a trek from Cardiff, not that that will stop me from going back, but hot off the press they are running a pop up shop in Cardiff from the 1st – 23rd December at 7-9 the Balcony, Castle Arcade. With effect from January this will become a permanent presence in Cardiff (at the same location) selling stuff retail, as well as offering food and drink to eat in (not hot food, but cheese, charcuterie, bread etc. 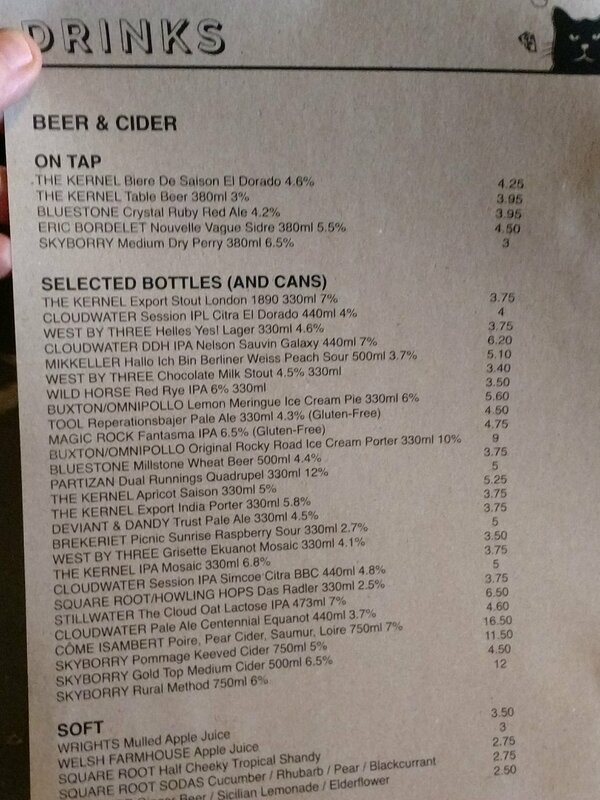 and their natural wines and craft beers). This is excellent news. 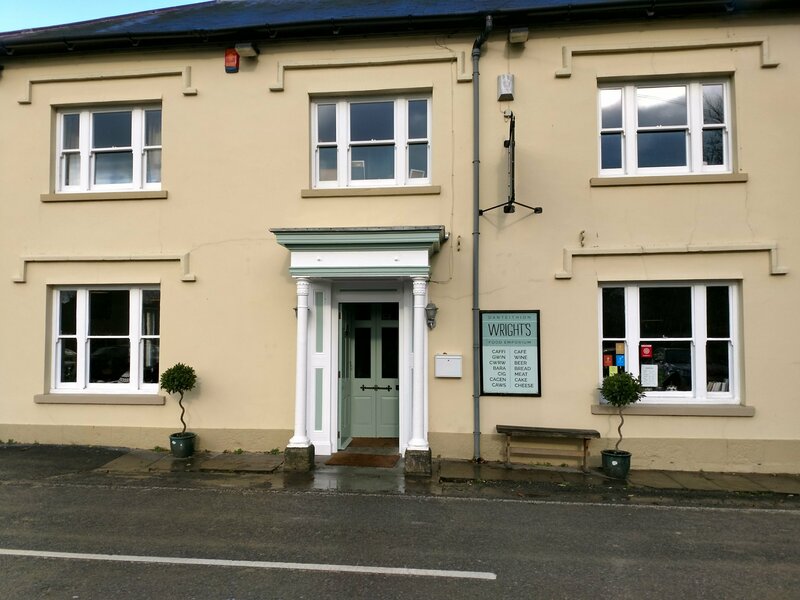 Address: Golden Cross Arms, Llarnathney, Carmarthen, SA32 8JU. Opening hours: Mon : 11.00 – 7pm; Tues: closed; Wed – Thurs: 09.00. – 19.00; Fri – Sat: 09.00 – late (last food orders 21.00) and Sun: 11.00 – 17.00. 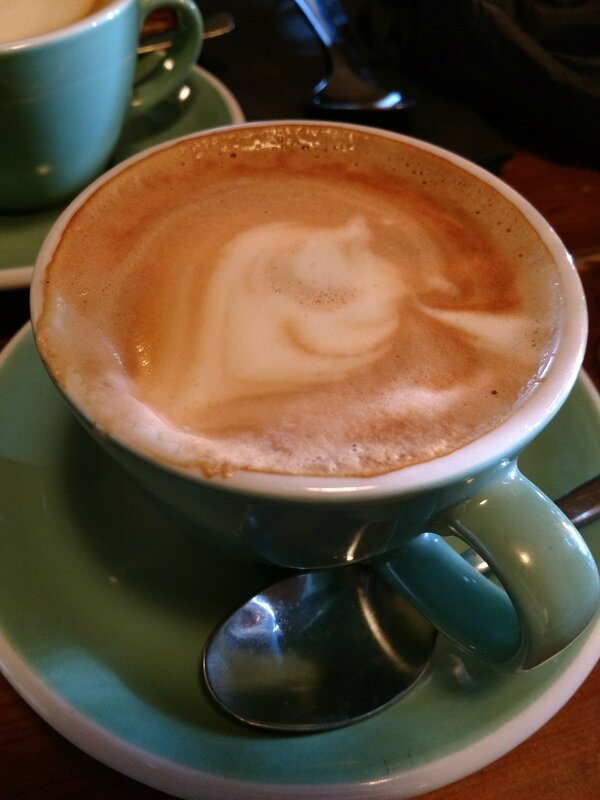 This entry was posted on Nov 19, 2017 by solicitingflavours in Alcoholic drink, Alternatives to sauvignon blanc, Austrian Wine, Bacon, Barista, beef, Beer, bitter, breakfast, Brunch, cafe, cake, Cardiff, charcuturie, cheap eats, cheese, Chenin Blanc, cider, coffee, craft beer, desserts, dog friendly, Drink, Dry white wine, fino, Food, Food and wine products, French wine, Gruner Veltliner, Ice cream, Jerez, Lunch, lunchtime, natural wines, Non alcoholic drink, Pinot Noir, raw cheese, real ale, Red Wine, restaurant review, retail, review, Rosé, salad, Sandwich, Sherry, Slovenian wine, Spanish wine, sweet wine, Uncategorized, vegetarian food, vegetarian wine, Wales, Welsh food, Welsh wines, White wine, wine mark up, wine pairing, Wright's Food Emporium.